New India Assurance Union Health Care Policy is a health insurance plan designed by the New India Assurance Company Ltd. Union Bank of India signed an agreement with The New India Assurance Company Ltd. to sell mediclaim policies to its customers. New India Assurance Union Health Care Policy is designed exclusively for the Account Holders of Union Bank of India, regardless of the fact whether they are having CD/SB/Deposit Account or having Demat, Borrower Account, Credit Card and Debit Card. New India Assurance Union Health Care Policy covers Medical expenses incurred by you for the treatment of any Illness or Disease or Injury during Policy period. Proposer, Spouse and 2 dependent children. New India Assurance Union Health Care Policy is eligible for Tax benefit under Section 80D as per IT Act. For information about Tax on Insurance Policies, refer www.taxqueries.in. Sum Insured can be enhanced only at the time of renewal of the policy. Personal Accident Insurance Cover is also available under New India Assurance union health care policy. Company will reimburse the medical expenses incurred by you for the treatment of any illness or disease or Injury. Union Health care policy is also having some exclusions which are listed under Non Coverages. For cataract claims – 20% of Sum Insured or Rs. 40,000/- whichever is less, for each eye. In case the insured sustain death resulting solely & directly accident caused by violent, external & visible means, then the company will pay a sum of Rs. 1,00,000/- during the policy term. Pre-existing diseases – covered after the waiting period of 3 years. For complete list of New India Assurance Union Health Care policy Inclusions and Exclusions, please refer New India Union Health Care policy document attached below. For any information or doubts or queries regarding New India Assurance Union Health Care policy call Toll Free number : 1800-209-1415. To buy New India Assurance Union Health Care policy you need to fill the proposal form with complete and accurate information and you have to submit it to The New India Assurance Office. New India Assurance Union Health Care Claim Form is to submitted to The New India Assurance Office or TPA during claim settlement. It is to be filled accurately and completely. 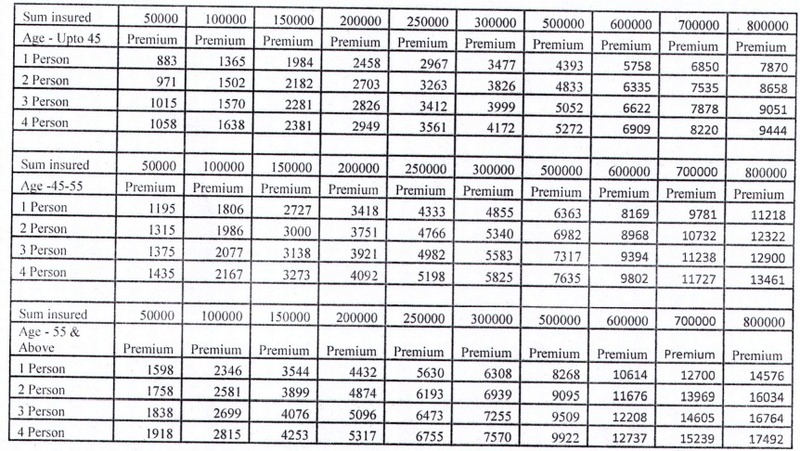 You can calculate the premium using New India Assurance Union Health Care Premium calculator. Personal details, Policy period, Number of members, Age and Sum assured and other details are required to calculate the premium. Can I Cancel the New India Assurance Union Health Care Policy? if we gonna transplant surgery then after which year we can go for it ?? Is there any co-payment is there? ?